The denizens of Terrinoth are as diverse as the wondrous lands themselves. As they journey across the realms, adventurers might encounter scholarly Greyhaven wizards, mysterious Latari Elves, gruff Dunwarr Dwarves, mighty rune golems, lyrical sword poets, and even Singhara Pridelords from the wilds of Zanaga. Unless treated with respect or caution, however, these individuals can be as dangerous as any ogre or dragon! 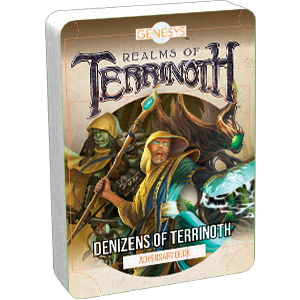 This deck requires the Genesys Core Rulebook and the Realms of Terrinoth supplement to use. It includes cards for 20 adversaries from all across the varied lands of Terrinoth and beyond.